Yep, that’s us. Last week I attended the latest manifestation of the Minnesota Men's Conference. 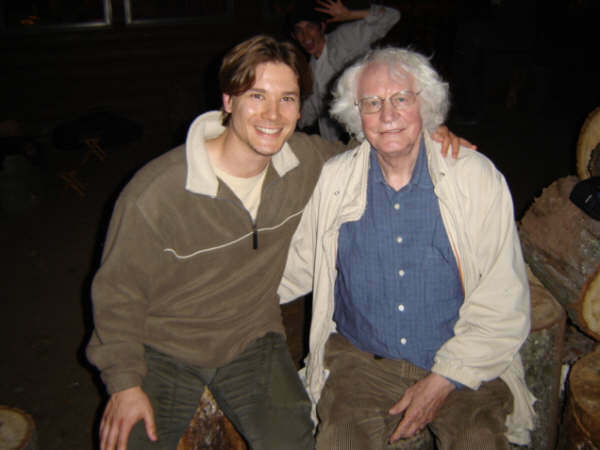 For over 20 years, poet Robert Bly, father of the expressive men’s movement and author of the landmark Iron John: A Book About Men, has led this gathering of cultural creatives and societal scofflaws from all over the United States, and from lands beyond. Folks invariably want to know what this is all about. And it’s hard to say, really, especially to my corporate compadres. This blog, which takes its name from the small group I joined at last year’s conference, may serve as an explanation by example. It's an ongoing effort at working out my experiences as they relate to the practice of screenwriting, following the premise that any practice, diligently followed, can be a spiritual path. And so as I piece together the details of my Norse epic, delve into my heritage and explore the mythic terrain that informs the pattern of my life, I have an opportunity to join the efforts of men like Bly, mythologist and storyteller Daniel Deardorff, Aikido instructor Tom Gambell, poet and educator Haki Madhubuti, and wizard of song Doug von Koss. This work, and the work you are doing, is a chance to be a danger to so-called civil society, to reintroduce the wildness that this society insists be buried, to open the imagination to a vision of life that goes far beyond the duel failures of war abroad and oppression at home. “Wasters, rhymers, minstrels and other vagabonds” were, according to Deardorff (citing Robert Graves), outlawed by Henry IV as a threat to the security of Wales. These unsuitables, ironically, were the keepers of myth and lore, including the Arthurian legends. By contrast, Iceland, home of the sagas, was for several centuries a land governed not by a king but by a national assembly called the Althing. Each summer, the leading men of Iceland, the godis and their thingmen, would arrive from the four quarters to discuss the issues of the day, recite and carry out the law, and join together in celebration. Maybe they were on to something. Something like Bly's dream of ecstatic cultural transformation. Myth and magic and skaldic mischief. Singing and drumming, poetry and politics. And ritual, lots of ritual. Deardorff, Daniel. The Other Within: The Genius of Deformity in Myth, Culture, & Psyche (Ashland, Oregon: White Cloud Press, 2004). Graves, Robert. The White Goddess: A Historical Grammar of Poetic Myth (New York: Farrar, Strauss and Giroux, 1966). I am so jealous. I'm a wastrel! I should have been there.